Following its critically acclaimed, award-winning Broadway run, All the Way (starring four-time Emmy® winner Bryan Cranston who reprises his Tony Award-winning role, is a riveting behind-the-scenes look at President Lyndon B. Johnson’s (LBJ) tumultuous first year in office in the wake of President Kennedy’s assassination. Hailed as “dramatically dazzling” (Baltimore Sun) and “powerful” (Chicago Sun-Times), All the Way follows LBJ during his early administration, as he stakes his presidency on what would be a historic, unprecedented Civil Rights Act. Johnson finds himself caught between the moral imperative of Dr. Martin Luther King, Jr. and the expectations of the southern Democratic Party leaders who brought Johnson to power. As King battles to press Johnson while controlling more radical elements of the Civil Rights movement, Johnson navigates the bill through Congress, winning a landslide victory against Barry Goldwater, but causing the South to defect from the Democratic Party. Playing a real-life character can be a daunting task for any actor -- especially if that character happens to be a former President of the United States. Under the wrong guidance, such a performance has the potential of veering too far into impression or even caricature. 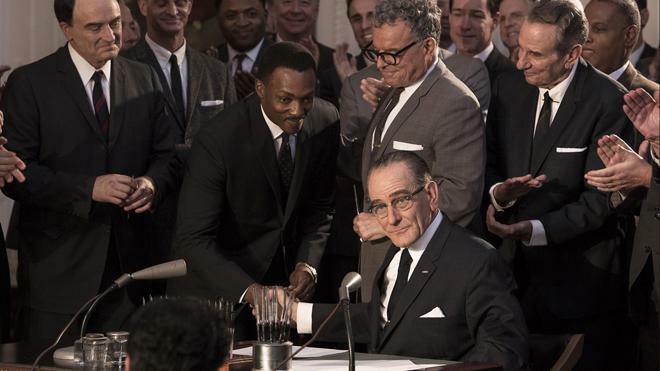 But in 'All the Way,' star Bryan Cranston and director Jay Roach find just the right balance between imitation and interpretation, crafting a nuanced and fully believable on-screen version of LBJ. Though the runtime can feel a bit by-the-numbers, the film's central performance remains gripping, weaving an engaging tale of political scheming and steadfast determination. Based on the Tony Award-winning play of the same name, the film focuses on Lyndon B. Johnson (Bryan Cranston) during his first year as President. 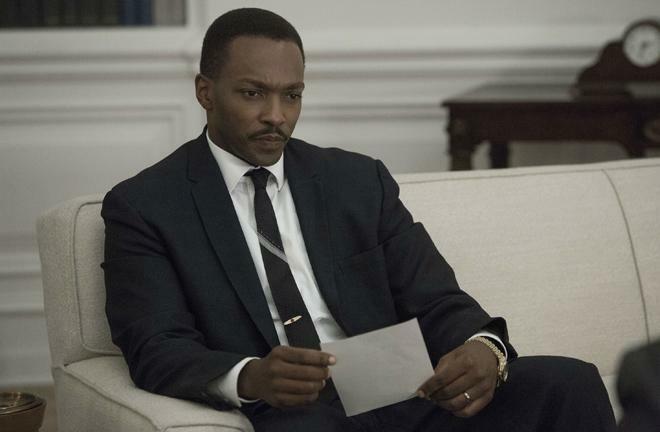 As Johnson tries to cement his place in the Oval Office following the assassination of John F. Kennedy, he turns toward working with Martin Luther King Jr. (Anthony Mackie) to pass the Civil Rights bill. But heavy opposition threatens to undermine the President's plans, causing conflict within the Democratic Party. At the same time, Johnson must deal with the mounting war in Vietnam and his own reelection campaign -- forcing the man to maneuver his way through a maze of winding politics. 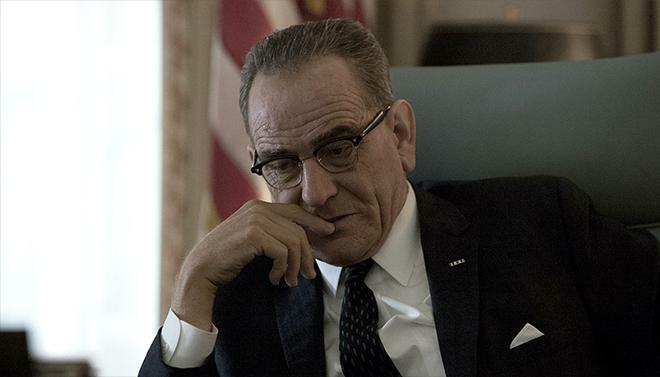 Through the use of surprisingly natural looking makeup, Cranston essentially disappears into the role, subtly altering key features of his hair and face to evoke the real LBJ without turning the actor into a rubber-masked impersonator. And as striking as this physical transformation is, Cranston's actual performance is even more impressive. Domineering yet charming, and fueled by a kind of folksy vulgarity, the actor balances Johnson's larger-than-life cowboy flourishes with more understated insecurities and a crafty sense of honed-in determination and political strategy. To this end, the majority of the runtime focuses on various conversations and deal-making plays as LBJ and MLK attempt to get the Civil Rights Act passed -- and this proves to be a pretty challenging task. Watching the two men work their respective colleagues and opponents leads to an enveloping examination of government tactics and gridlock -- one that remains frustratingly relevant to our current system. Likewise, the script's historical themes of racial intolerance hold strong parallels to contemporary issues as well, revealing how far we've progressed and how far we still have to go. But as engaging as most of these sequences are, the film as a whole feels a little unbalanced with its split between Johnson and King. As it stands, the focus is clearly meant to be on LBJ, but it sometimes feels as if the movie can't decide if it wants to be a film primarily about Johnson or about Johnson and Martin Luther King Jr. -- making some of King's scenes feel simultaneously superfluous and underdeveloped. Furthermore, the movie's overall storytelling style is a little generic, running through the bullet points of LBJ's first year in office without carving a distinct visual or narrative identity of its own. To the filmmakers' credit, a few sporadic voice over narrations coupled with dramatic slow motion shots tied to Johnson's internal, often acerbic thoughts of doubt and discord hint at a film with a bit more edge, but the director fails to ever go "all the way" with this motif, opting to keep things more conventional. Thankfully, more conventional doesn't mean bad. In fact, far from it. Marked by a stellar performance from Bryan Cranston, 'All The Way' offers an interesting mixture of character study and political history, illuminating the triumphs and insecurities of Lyndon B. Johnson's early days as an "accidental" President -- even if the runtime itself could use a bit more of Johnson's trademark bite. HBO presents 'All the Way' on a BD-50 Blu-ray disc housed in a standard keepcase. Instructions for an iTunes/UltraViolet Digital Copy are included inside. After loading, the disc transitions directly to a standard menu. The packaging indicates that the release is region A coded. The movie is provided with a 1080p/AVC MPEG-4 transfer in the 1.78:1 aspect ratio. Shot on the Arri Alexa XT, the image offers a solid yet occasionally drab appearance. The digital source is free from any egregious artifacts, but there is some minor noise visible here and there. Detail varies a bit from scene to scene, moving from sharper sequences (like the opening moments and a later rally) and nicely detailed close-ups (highlighting the impressive makeup used on Cranston), to comparatively softer wide shots throughout the White House that lack finer textures and depth. Colors are rendered well, but the palette is a noticeably subdued and flesh-tones veer toward a faintly rosy appearance. Thankfully, contrast is balanced nicely with bright whites and deep blacks. Though seemingly authentic to the filmmakers' intentions, 'All the Way' is a bit bland on Blu-ray. The image can be little flat and dull at times, but the modest style suits the content well. The film is presented with an English DTS-HD MA 5.1 track, along with optional English SDH, French, Spanish, and Portuguese subtitles. Much like the video transfer, this mix here is rather modest in design, but the audio complements the film nicely. Dialogue and voice over narration are clear, full, and well prioritized, bringing ample presence to LBJ's folksy vulgarity. The soundscape is a bit limited in scope, but the primary White House setting features appropriate effects like office clatter, ringing phones, and typing. And though primarily front-loaded, surrounds do chime in from time to time when called for, spreading applause during speeches and rallies to the rears. Likewise, while the majority of the mix is pretty lowkey, the opening Kennedy assassination scene features some comparatively robust design work with forceful gunshots, screams, and sirens. The minimalist sound design gets the job done just fine without any technical issues, but a bit more immersion here and there could have helped to elevate the experience. Bryan Cranston Becoming LBJ (HD, 2 min) – Presented in 1080i with DTS-HD MA 2.0 audio, this is a very brief look at the film's impressive makeup process. All the Way: A Walk Through History (HD, 10 min) – Presented in 1080i with DTS-HD MA 2.0 audio, this is a featurette focused on the history depicted in the movie with cast, crew, and historians discussing the civil rights act, Kennedy assassination, Johnson, and MLK. 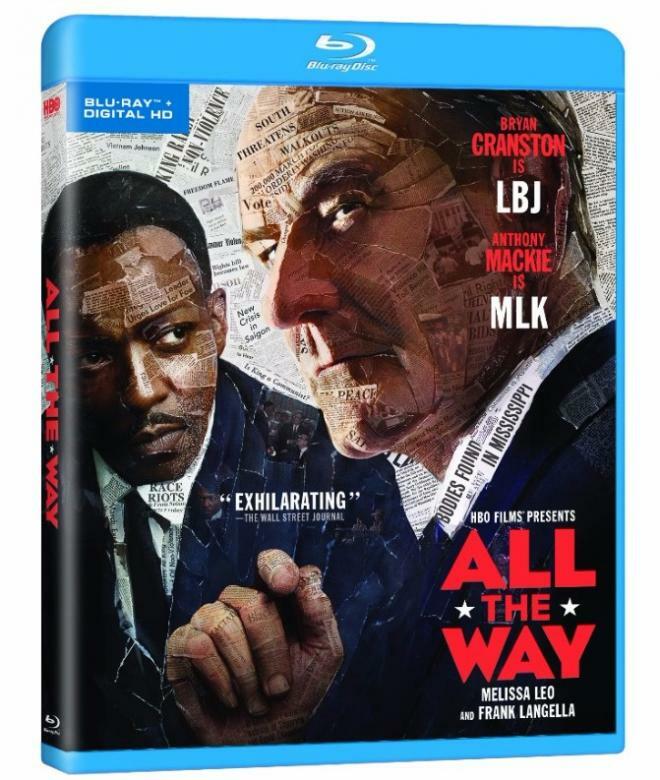 'All the Way' offers an interesting look at Lyndon B. Johnson's first year as President, weaving an engaging mixture of character study and political drama. The film can be a bit generic at times, but Bryan Cranston's strong performance elevates the runtime. Though inherently modest by design, the video transfer and audio mix are both solid. Unfortunately, we only get two brief supplements, but the disc as a whole is definitely worth a look.